I’ve had a busy week and decided to forgo the blog post I had planned, but I got an unexpected snow day today so here we are! As I’ve said before, I love the creative process behind baking and styling and photographing, but sometimes putting the words to go along with the photos can be a drag to me. And as a result some weeks go by without any post, just because I get too busy (or too lazy) to complete my least favorite part of the process. Thankfully I had a day off with plenty of time to procrastinate before sitting at my laptop, and I’m glad – this cookie cake shouldn’t be skipped over any longer! 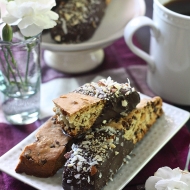 Ryan always says that seven layer bars (aka magic bars) are one of his favorite treats. 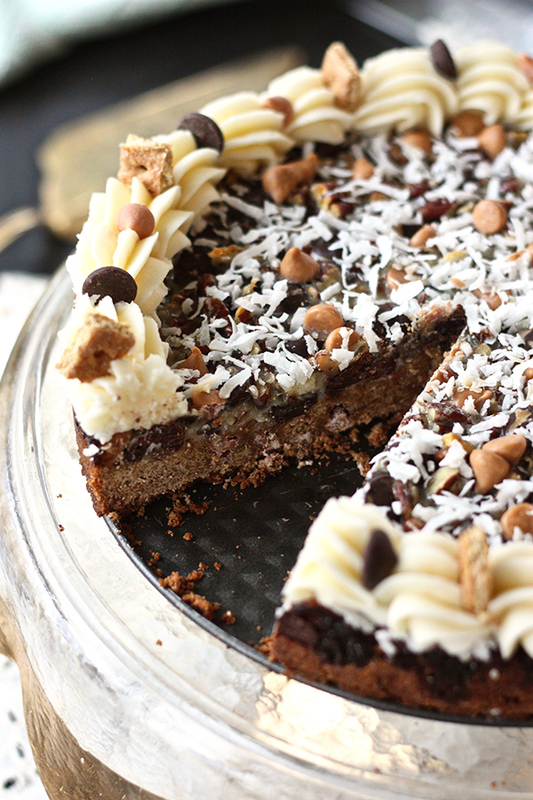 And my Mom is also a huge chocolate and coconut fan, so I have been long overdue for a seven layer bar recipe. 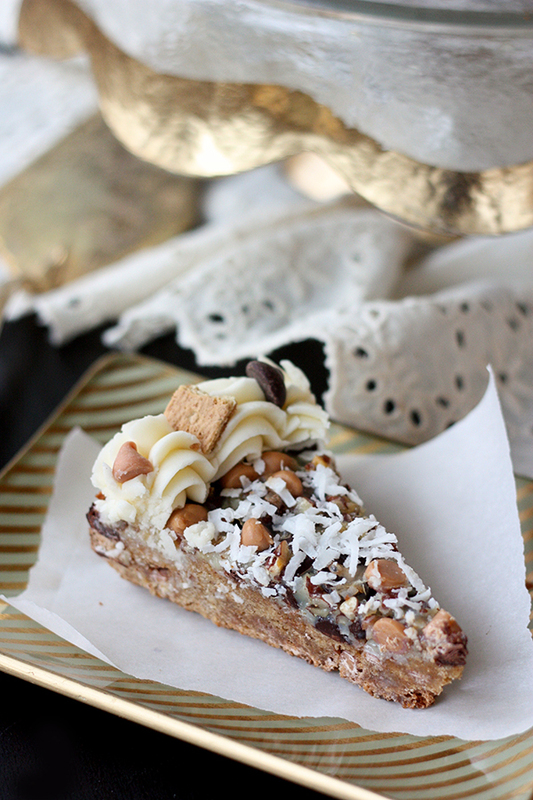 I made magic bar cookies a few years ago, but since I made this for my Mom’s birthday, I wanted to recreate the classic seven layer bar once again into something a little different and worth celebrating with – a cookie cake! 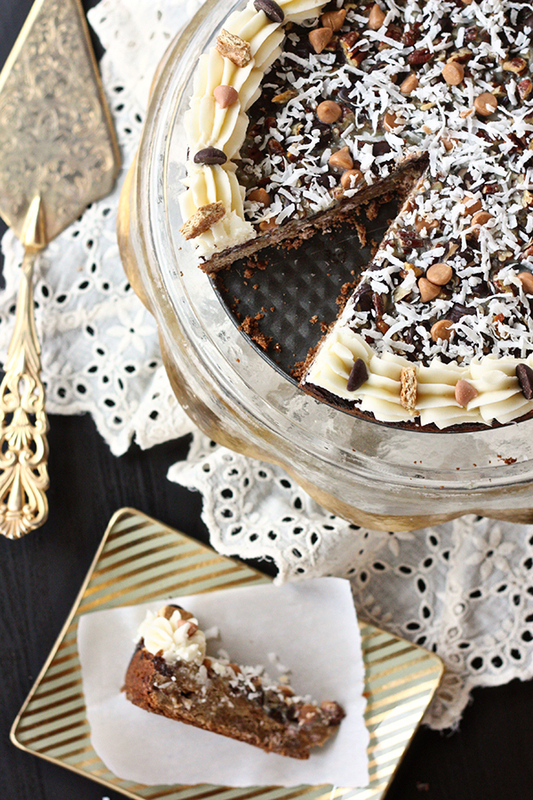 It has all of the flavors of seven layer bars – chocolate, coconut, butterscotch, graham crackers, condensed milk, and pecans – just morphed into a cookie cake as a twist. With a pretty piped border and fancy gold accessories to style the cake, this bake sale classic is transformed into a birthday-worthy treat! 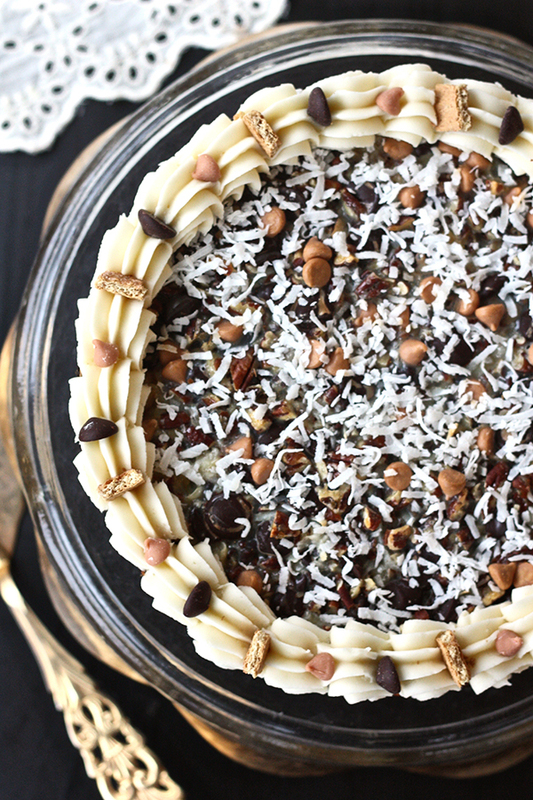 Whether you call them magic bars, or seven layer bars, or have never heard of such a thing but like ridiculously good combinations of sweet flavors, you’re going to love this cookie cake. The recipe can also be just baked as bars as Sally did, but I recommend baking in a springform pan and adding the border of frosting for some extra flair! Superbowl cake, anyone? Preheat the oven to 350 degrees and spray a 9" springform pan with non-stick spray. Set aside. In the bowl of an electric mixer, beat together the butter and brown sugar until light and fluffy, about 2-3 minutes. Add the vanilla and egg, continuing to beat until well combined, and scraping down the sides of the bowl as necessary. 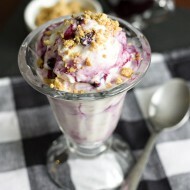 In a medium bowl, whisk together the flour, graham cracker crumbs, and baking powder together. With the mixer on low speed, slowly add the dry ingredients and mix until just combined. Add the butterscotch chips and incorporate with a rubber spatula until evenly distributed. Press graham cracker dough into the prepared baking pan and bake for 5 minutes. Remove from the oven and layer with chocolate chips, butterscotch chips, coconut, and pecans. Drizzle sweetened condensed milk evenly on top. Bake the bars for 20-25 minutes, until set. Halfway through baking I would recommend rotating the pan and covering it with tinfoil to prevent any unwanted browning. Allow the cake to cool in the pan for 30 minutes, then transfer to the fridge to cool completely. Once the bottom of the pan is cool, you can release the sides from the bottom of the pan. For the cream cheese frosting, beat together the butter and cream cheese in the bowl of an electric mixer on medium-high speed until fluffy, about 2-3 minutes. Slowly add the powdered sugar and continue to beat for another minute. Add the vanilla and mix again. Transfer frosting to a piping bag fit with a large star tip and pipe border on cooled cake. Add extra graham cracker pieces, chocolate chips, and butterscotch chips to decorate if desired. Wow, that looks insanely decadent! I love it. 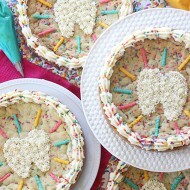 Cookie cakes are just the best!